Bill Acraman has an MA degree in Maths from Oxford University. He had an operations research career in Bread and Scaffolding Industries. Bill is a Scout Leader in Sussex and London. He is a widower with three children and his hobbies include bridge and, formerly, sailing. 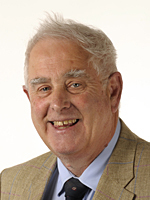 He has been a Sussex councillor since 1997.